At some point in every fan's life the curtain gets peeled back and they realize that their beloved sports franchises are not single-minded entities completely devoted to on-field success. They employ accountants and business managers, have substantial advertising budgets, and eagerly engage in as many sponsorships as possible/legally permitted. Ultimately, as a result of the increasing popularity of sports and some absolutely ridiculous broadcasting agreements has seen the industry balloon into a $750 billion business. In The Sports Strategist, Irving Rein, a communications professor at Northwestern, Ben Shields, the former head of social media at ESPN, and Adam Grossman, a consultant that has worked with the likes of the Minnesota Timerwolves and head of a sports analytics firm, have written a readable and entertaining guide to navigating the growing complexities of sports business and developing plans for financial success without relying completely on winning. It provides a wealth of information to those working in or looking to break into the field but also makes for an enlightening read for general sports fans looking to better understand the business side of things. The book is primarily concerned with making money from off-field endeavors. While they acknowledge the importance of winning, (sometimes anyway, there are plenty of examples of good teams in dire financial straits and vice versa and a 2009 study by Kirk Wakefield at Baylor found that current season winning percentage trailed stadium quality and star players as factors that impacted attendance for MLB games), corporate officers, marketing teams, and their ilk have little direct control over such factors. Thus, personnel matters are largely pushed to the background and the authors examine broader business strategies related to topics such as public relations, stadium experience, and branding. The Sports Strategist is mainly comprised of relevant case studies relating to the current major subjects in the industry, from marketing strategies to currying municipal favor for stadium funding and other matters. The book is broad in scope, covering all levels of athletics from high school to professional and leagues ranging from the English Premier League to single A baseball. The prose is rather jargon-free and while I was familiar with some of their examples, some of the cases were new and fascinating to me. Learning about tactics such as Northwestern using the Dutch auction model to price college basketball tickets and the Cleveland Indians' clever Lunch and Three Innings promotion to attract downtown office workers made the book worthwhile. All key takeaways are lucidly explained and sometimes concepts are codified into useful models that readers can apply to their own experiences. My only real criticism is that this wide-ranging "breadth over depth" approach left me wishing for more detail in certain passages. I should mention that I generally stray away from business books (I like to spend my leisure time in a less "work"-y fashion) and I don't work in sports. I picked The Sports Strategist up because I find sports business interesting and have always enjoyed the Wall Street Journal and Economist articles highlighting the innovative ways teams and leagues are trying to maximize profits. I was looking to learn more about the subject and The Sports Strategist delivered on that premise. I gained insight into how sports teams try to attract fans, control social media catastrophes and handle other business matters and was entertained throughout. Additionally, many of the broad concepts promoted in the book are applicable to other industries. The authors emphasize more general strategies such as the importance of differentiation, ensuring all employee teams are on the same page, utilizing technology effectively, and meeting problems with a holistic approach, things that are certainly important outside the athletic realm. More business-minded readers can get a good bit out of the book (especially from some innovative ways teams have utilized new technologies) even if they work outside of sports. 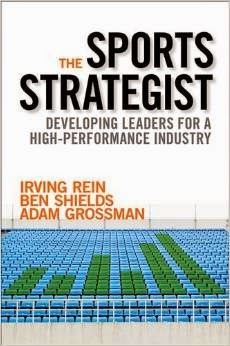 The Sports Strategist was a surprisingly engaging look into the sports industry. While it seems mainly designed for managers inside and outside sports to develop successful strategies, it also provides a readable overview of the inventive methods teams are using to ensure financial success for anyone looking to learn more on the subject. Books can't really be read in a vacuum. Every work I pick up is inevitably assessed in comparison with other similar pieces. 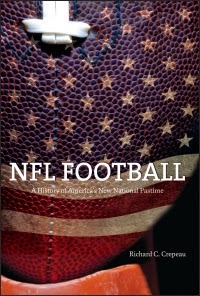 So while Richard Crepeau's NFL Football is a decent examination of the NFL's history and how the league been impacted by (and impacted) American culture and economics, it pales in comparison to other books on the subject and thus I can't recommend it incredibly highly. Crepeau is a history professor at the University of Central Florida and has written a past book on baseball's history. According to BaseballReference.com, he is also apparently on the shortlist to succeed Bud Selig as MLB Commissioner. Despite his academic day job (for now anyway), NFL Football is a largely readable account and its numerous citations generally come from mainstream books and media sources rather than abstruse scholarly texts. Some sections are a little dry but that is more due to familiar content rather than an overly-scholastic tone. The book proceeds through a chronological overview of the league with a large emphasis on the economics and culture of the NFL. He covers major league events, the exponential growth of television revenues, staggered integration (thank you George Preston Marshall) and hits the major figures like Pete Rozelle and Jim Brown with some in-depth passages. There are no glaring omissions and all major bases are covered, but much of the material is going to be old hat for a reader willing to read a history professor's account of the league. The book somewhat curiously concludes with a chapter on the history of the Super Bowl that outlines its evolution into an exorbitantly expensive festival of athletic excess. Crepeau presents NFL Football as a synthesis of literature on the NFL's history and as a result leans heavily on preexisting sources. Unfortunately, this approach leaves the book largely bereft of any original analysis. There were no interviews conducted for the book and he culls much of the content from popular works so fans of the sport may not find many new insights. Crepeau includes extensive quotes from books such as Michael McCambridge's America's Game that are more comprehensive and entertaining accounts of the same subject. NFL Football does occasionally shine when Crepeau digs a bit deeper for more obscure and older sources demonstrating the culture of the league and era such as a 1971 Sports Illustrated article that purported a slew of anthropological and physiological reasons for black athletes' dominance in the NFL and a 1969 SI piece about drugs in sports. NFL Football gives a broad overview of an expansive subject. It does an adequate job at its stated goal of synthesizing the existing literature on the topic but offers little in the way of original content and I feel that other books such as America's Game do a better job outlining the history of the NFL.